You have caught a great moment in time. the boys are so adorable and lovely! their obvious happiness made me smile. is there anything better than a child’s smile? especially when experiencing pure joy. great shots. beautiful. sart, you made my day with these shots. i never engage in this but i really have to this time: the little boy in turquoise blue looks like a young RONALDO (muscle structure is clear to see although he is so young). love it! and they are so happy, it’s wonderful to live vicariously through these boys if even just for a moment. Love the way the one running away has his little fingers crossed! I love how he has his fingers crossed in the last pic. precious! I live in this beautiful city of great contrasts. love how these photos tell a story. Your shots from rio have been some of my favorites! Awwwww :) what cute kids out on the beach, having fun! Wonderful! So unselfconscious & full of the joys of living. Oh.. so cute! The boy in the bright blue shorts looks like a mini-ronaldo! :) So alike! Children are the most beautiful human beings. ISO love the song.. perhaps one day I will travel there.. in a plane.. oppose to in my mind. Georgeous pictures – you really have caught magic moments. It makes me so happy to look at them – thank you! Turquoise trunks kid is so funny looking (in a good way). Like a little man. Look at the muscles. Clearly not a kid who sits in all day playing nintendo. And that last shot is just joy. so far rio has been dissapointingly unorigional…these pictures save it. YOU CAPTURED NOT JUST OUTFITS, BUT PERSONALITIES. yeah! I’m so lucky! I´m carioca and live in Rio. The wonderfull city! I guess they’re nice pictures, but I come here for the clothes. These photos bring so much joy to look at – I love seeing these happy faces! i love this pic. it reminds me of my family..
made me remember the advice you gave on capturing the moment and inspiration on the photo shoot you did with your lovely daughters on the beach. i think you can spend rest of your life in rio. Ah to be so young and carefree… It is truly a beautiful time in our lives that once gone, can never be recaptured. Thanks to you, this particualr moment in these boy’s lives is forever captured in celluloid. I’m jealous, I really wish I was in Rio tanning and frolicking in the beach right now. You are amazing! You can take pictures of perfect moments! How cute! They look to be practising capoeira in the 2nd picture. THIS is what i call happiness!!! wow, there’s no one on the beach! that’s insane for Ipanema. i have to say that Brazilians from all walks of life are the classiest people I have ever met and you can see it in all the beautiful photos. SAUDADE PRA BRASIL! try and visit some Choro Samba halls and street samba in Lapa if you can for some great moments and amazing music. I’m brazilian, but from São Paulo. My city is amazing, but I have to admit that people in Rio de Janeiro is beautiful and has a greeeeat body! What a beach does to a city, right? These photos are the most beautiful you have taken. Incredible, man! so young and carefree, i miss those days. whenever i see your rio shots i wish is was there. wow even the little kids are jacked in rio. I’m in love. These happy little boys made me smile. ohhhhhh this series is one of my favorites ever! thank you! joy. Thank you! This shot made my day. Life is for the living! After a trip to NYC, I have renewed interest in fashion and your site. Keep up the great work. Those are fabulous. I've gotten more joy out of imagining you capturing these shots & smiling at the boys. All in all, you've pulled this viewer into the shot. cute!!! the boys are adorable. you really captured how much fun they are having. and can i just say… the light in rio is beautiful. It’s a pity he hasn’t taken pictures of people in the city, just by the sea… The beach is only 10% of what Rio is! Well, the other pictures from Rio are great too, as always… I was just hoping that he could maybe capture a little more of the Brazilian way of living in them. Most of the people look like actors employed by Rede Globo, Brazil’s biggest TV broadcaster. Those are some buff kids! 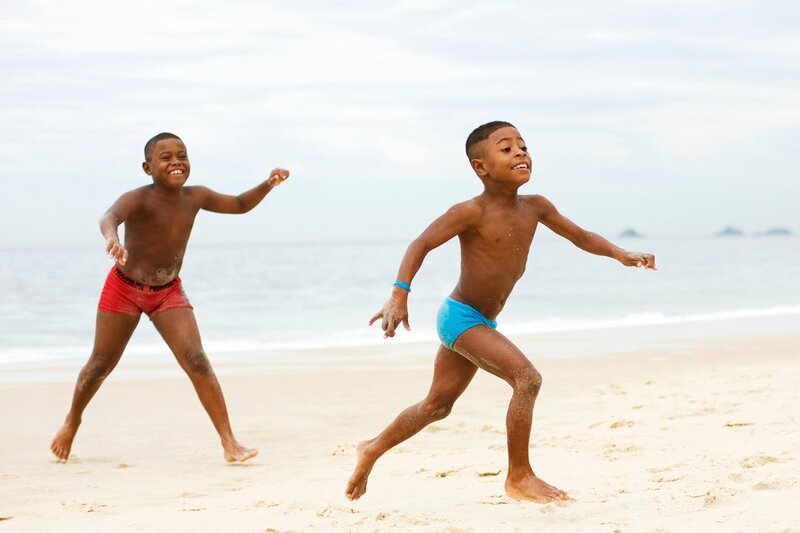 They should set an example for children here in the U.S.
Out to play in rio..boys in bright colorful shorts which contrasts with the natural calm of the environment.. The second photo reminds me of my cousins playing on the beach in Anguilla. I like that you shoot more than just clothes. It’s all connected. The spirit of a place, the people, the clothes, etc. It’s good to see people with swimming costumes whereas we are wearing coats in Paris! Those kids are just the cutest! That muscular little body speaks of work and I don’t mean work out. Some of those kids working on the streets of Rio begin awfully young and lead everything but a carefree life. Yet it is inspiring to witness their ability to let all their worries drop, reclaim some innocence and behave like the kids they really are. Nice shots. What joyful boys! Children always represent the essence of a culture. I think you captured it here. They are carfefree and playful here but their bodies and faces also reflect the work that they probably do daily. I hope you go to Lapa and show another aspect of Rio too! I love all the Brazil photos, but especially enjoy the ones of the boys and their movements. I’ve a fascination for Brazil – always have since I heard about Rio in elementary school a long time ago, but again most recently when I read Death in Brazil by Peter Robb. Also follow some police procedurals set in Brazil. Great job capturing the moment. This is the true heart and soul of Rio…..
adorable! I love his haircut too. love these sort of posts. gosh … that beach is really amazing, isn’t it? The innocence of children. These photographs reminds me of my own childhood growing up in the Caribbean. Great shots of children with joyful personalities and enjoying themselves, as all children should. this is so brazil to me. obrigada o senhor! I love the solo of the boy in the blue trunks. The sand, crawling up his left leg, makes him appear to have risen from underground. An adorable, myth-like Poseidon-boy. Ahhh the good life! The world would be a much better place if adults could feel this way just once a week! As boys we played as men. As men we play as boys. The last picture is such a beautiful picture it made me want to cry. Ahh to me young and carefree again. Beautiful shots. Leaving aside the “romance” of this pictures…what I really like about them, is the little turquoise boy with a matching little turquoise wrist band!…that’s cool! Crazy shots, on my screen, the scenery is one tone. I love the pop of swim-suits. But these days are long gone.